Let me show you, why we can never trust this Government. The National Investment Fund is like a Ponzi scheme. On October 2nd 2017, in his presentation of the 2018 budget Finance Minister Imbert announced that as the assets of the CL Financial Group became available from the liquidators, these assets would be divested either as public offerings on the TT stock exchange or through placement on a new national mutual fund. Do you know that at the date of this announcement there was no such company in existence? A company search reveals that the NAME “The National Investment Fund Holding Company” was only approved by the Companies Registry one whole week after, on May 17th 2018. The Minister of Finance boasts that his Government is making provision for the man who has untouched savings of $100,000 and $250,000 that he has lying around in a bank, that can be withdrawn and placed in this facility. It has been more than one year since we have had unemployment statistics in Trinidad and Tobago. The last set of unemployment statistics is since June 2017. Why are they hiding the crisis of unemployment? And without knowing the true state of workers in this country, how can the policy decisions of the Minister of Finance ever be informed. He will always be wrong. The fact the Minister prefers to ignore is the level of hardship being experienced by the average citizen, the level of frustration by people who cannot get jobs or by people who have to dip into their savings to make ends meet. This is fact… even with the highly questionable information Minister Imbert uses, the GDP now is lower than in 2015 under the PP Government. How is that growth? Imbert indicated during the mid-year review that the economy is turning around. According to him, the non-oil sector is growing, the energy sector is booming and they have collected millions more in revenue than they had estimated. Yet there is no relief for citizens. He continues borrowing, running up massive debts that you and I, our children and their children will have to pay. More pressure coming as they are considering increases in utility rates and he remains adamant on imposing the dreaded property tax on the population. There is a level of uncertainty with regards to the implementation of the taxes. I am aware of persons who have indicated that valuators are coming to their homes and valuing their property. I am not aware whether these persons have been trained or qualified to conduct valuations. The Board may upon the application of the owner of land authorise the deferral of the payment of the assessed tax on the land on the grounds of the impoverished condition of the owner and his inability to improve his financial position significantly by reason of age, impaired health or other special circumstances, that undue hardship to that owner would otherwise ensue. The relief granted under this section shall be valid for two years and may be renewed if the conditions of the applicant as evidenced under subsection (2) remains unchanged. All pensioners will have to pay property tax. They will get a deferral but that tax attaches to land, so on inheritance their children will have to pay the deferred tax. The tax is deferred on a 2-year basis, every 2 years they will have to go to the office and seek a deferral. They will have old people, disabled people lining up. They promised a form will be generated for the exemption, up until now no form has been drafted. Every person who squats on land will have to pay the tax as an owner has been defined as an occupier. The liability to tax of the owner of any chattel fixed or affixed to land does not create a legal entitlement to the land upon which the chattel is located where the owner of the chattel is not the legal owner of the land. They want you pay the tax for the land but it does not give you an entitlement to own the land. They are making this up as they go. It is poorly thought out. That is why I said that when we get into government, this property tax this government holding like an axe over your heads, will be removed. This PNM Government seems to think they can say and do anything and get away with it. They have driven up the country’s debt, going around buying boats without proper procurement processes, and giving the people some “Nansi” story every week. The Opposition has been holding them to account, but they are so deceptive, we have to scrutinize every word they say and every document they bring to Parliament. Remember that ghost ship? The one that is forever coming to Trinidad and Tobago but still cannot reach? The first valuation was from Oceanic Design and Survey, a company that is affiliated to the owner of the vessel Sea Lease Pty Limited, which valued it at US$19M. The second valuation was done by Schulte Marine Concepts (SMC) valued the vessel at $US35- US$38M. The builder of the vessel has never constructed a vessel of this size. The GP is 74m long, the longest vessel Sea Transport ever designed was 68m long. There is no track record of the yard, Nansha Shipyard in Guangzhou, Guandong, China, that constructed the vessel. The vessel was completed in the year 2016 which is when the International Tonnage Certificate was issued – February 2016. The documents provided suggest (see page 10 of the Oceanic Design and Survey Report) that only her “internal fitting out” remained unfinished. This is normal where the last “bells and whistles” will be left to the very end. It is inarguable the vessel was fully functional when she was damaged in her sea trials. The provisional certificate of registry from Vanuatu indicated the vessel was built in 2015. (I think it meant construction started in 2015). 3 years ago! Tonight I ask the question – whether a high-ranking government official from Trinidad and Tobago attended a conference sometime in October 2017 where that official met with a high-ranking Venezuelan government official? We must understand that the Government was looking for a boat to purchase in 2017. So it is my question whether these two high-ranking officials struck a deal, with Trinidad and Tobago agreeing to bail out its Venezuelan counter-part. All of this should be of grave concern, but this Government continues to try to make them out to be trivial. Now the Government came to Parliament to adopt a report by the Joint Select Committee on the Anti-Terrorism Bill, and it was clear that the Attorney General wished to simply pass the legislation with amendments coming out of the JSC. The most important is that the Bill, in its current form, gives too much power to the Attorney General. Specific clauses in the Bill give the Attorney General powers that are not possible under the Constitution, and they must be amended. One of these was the AG would have access to financial information under the FIU. We fought against that. We in the Opposition have proposed that where the legislation confers powers onto the Attorney General that those powers would be more appropriately housed in the Office of the Director of Public Prosecutions for local matters and the Central Authority for international matters. We submitted amendments to the Bill which do not change the material impact of the law, but would ensure that we have the appropriate checks and balances on any attempted or perceived political interference. The AG proposed to give himself extra powers under the legislation so that he can get your financial information or refer matters to the Commissioner of Police and then the Commissioner would be obliged to give him a police investigation on any person. I stood strongly against the AG having these powers. The government needs the Opposition’s support to pass this Bill and I have signalled that the Opposition will support this Bill only if those powers have been removed. The UNC will ensure that the rights of every single citizen are protected and continue to be protected. I have always been a strong advocate against discrimination and persecution. I will always fight for you and stand up for what is right even at times when it is not the most popular decision. And I have said, we will support good law, and we will support this legislation, however the changes must be made to protect each and every citizen of this country. 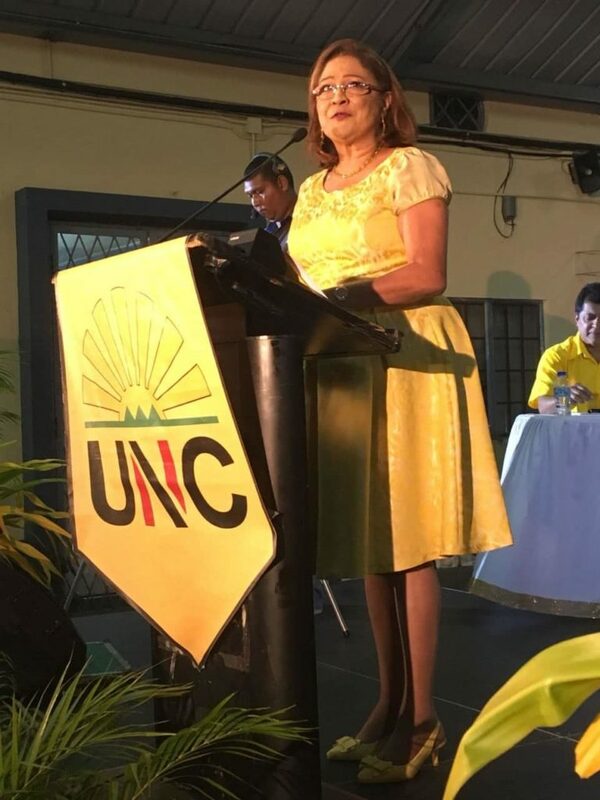 A vote for the PNM tells them it’s okay to have rampant crime become the norm in this country; with women working in office getting their throats slit to young boys being shot in the yards of their homes and NOTHING being done by THREE Ministers of National Security. It is saying that it’s okay that not a single new job has been created, while more are being sent home, driving citizens more and more into abject poverty. they slashed disability grants, they took away the laptops, they keep imposing more and more taxes. How can we work to save T&T? That is why we are here. I am tasked, and the Opposition takes its role very seriously – to act as guardians of our democracy, and guardians of our constitutional rights. This why I ask you tonight, will you join with me, will you ensure that on election day, you make certain that the PNM knows that we, as a people, are saying no more. My brothers and sisters, as bad as things may seem, we must remain hopeful. We can and will overcome our challenges, together. What is it we all work so hard for? What matters most to us is our children. Our children offer us hope, every day that we are pummeled and pained by this Rowley government, we bear it for the sake of the children, because we know that with hope, dreams and wishes can be fulfilled, life can be better and a better future guaranteed. What we dare to hope for is a day, a morning when we can wake up knowing that we had a restful night, free from worries, free from crime, knowing that no crime has affected our home, or that in our community, we want to wake up when we don’t see the screaming headlines announcing the deaths of mothers and children, sons, daughters, fathers in our land. We want to wake up to a day when the food that we get up to prepare, that that day will be a healthy day, a wholesome day, it will be a day when we are not faced with panic about illness, about one of our members, our loved ones falling ill. Together We will all make this day happen. We have a long way to go to achieve this future that I envision. So how do we get to where we want to be, that bright future? First of all, we must believe that such a day is possible. Everything is possible, once you believe, and this something that each of us can do every single day. We can make that day a reality, when we stop thinking that the changes required are impossible and beyond us. When we believe that they are within our grasp, that we can do it and we will do it! So let nothing divide us except our vision, our goal, our aim, to take Trinidad and Tobago forward into the future. Let us Unite, let us unite with that vision and when we have that same vison, together, united, we make that our life works mission to achieve it…. That is what we must do now. We will do this united under the banner of the rising sun! We are committed to getting ourselves ready for that day, a day of equity, a day of equality, a day when hopes are realized, a day of emancipation from this cruel and wicked Rowley government. Are you ready to move with us? Are you ready to return the party with a plan to rescue Trinidad and Tobago from this uncaring, incompetent Rowley-led Government?